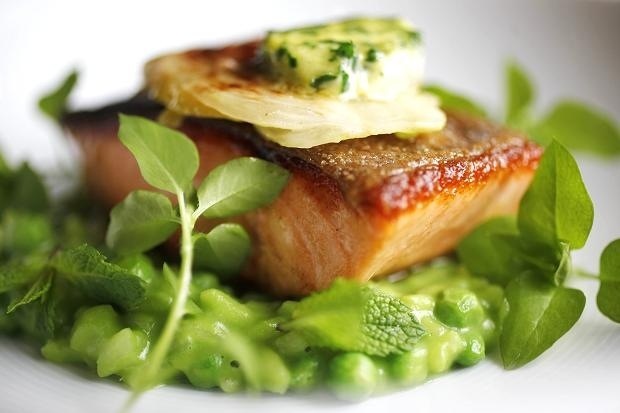 Salmon with Minted Pea Risotto and Lemon Butter. This is a fantastic recipe created by Michelin Starred Chef Marcus Wareing. Fresh, zingy flavours from the risotto compliment the simple fresh pan roasted salmon steak. A perfect addition to the “Dinner party recipes that wow” section. Marcus Wareing at The Berkeley, has two Michelin stars, five AA rosettes & 8/10 in the Good Food Guide. This entry was posted in Dinner party recipes that wow, How To, Recipe, Try this out! and tagged dinner party recipes, film shape, freshly ground black pepper, marcus wareing, salmon fillets, salmon steak. Bookmark the permalink. ← Seared Sirloin of Beef with Coriander and Norfolk Lavender Salad. Menu Select Category Competition Time! Details and Reviews Dinner party recipes that wow How To Recipe Review Special Offers Tapas Try this out! Uncategorized Who and What! Who are they?